Multiple award winning designer/builder Palmer Homes is pleased to introduce The Getaway. The Getaway is designed with an abundance of sliding doors to let in natural light take advantage of your fine waterfront property. Fits on any standard Cape Coral lot, and incorporates large rooms you will certainly use to the fullest. A master suite you won’t soon forget at over 875 square feet, a large soaking tub and walk in shower. 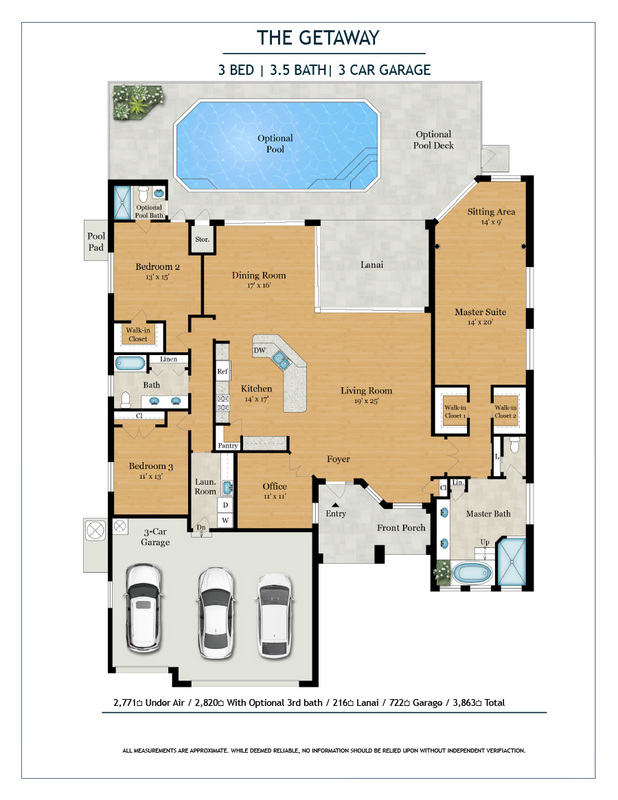 The master bedroom, at over 29 feet long, a deck mounted master tub, and a two large walk in closets make up an ultimate master suite you may not want to ever leave. 90 degree sliders, and a total of over 420 square feet of glass on the rear of the home! The dining room is the best seat in the house, and has been located perfectly next to the pool, lanai and kitchen. The lanai is totally enclosed by electric roll down shutters, standard. 10’ ceilings, 8’ tall doors, many different roofing options, custom wood cabinetry and floor coverings, paint colors and your dream pool all await your selection to make your Gataway a reality. As is with all Palmer Homes, double pane insulated Low E impact glass, high efficiency insulation, High efficiency Trane A/C, granite everywhere, 8′ tall solid core doors, ten foot to 13 foot ceilings, asphalt, tile, clay, or metal roof, all wood custom built kitchen, ceramic floors and stainless steel appliances are all standard. This home is one you actually want to come home to, because quality is standard. We do not offer this home in an economy, poor quality version, because we don’t build that way. We do not offer plastic countertops, cheap imported cabinets, low grade paint, we do not do drywall ceilings outside, unreasonable allowances, “builder grade” anything. If you are looking for that quality, there are many builders that specialize in economy grade homes. We only offer quality materials and craftsmanship, standard. 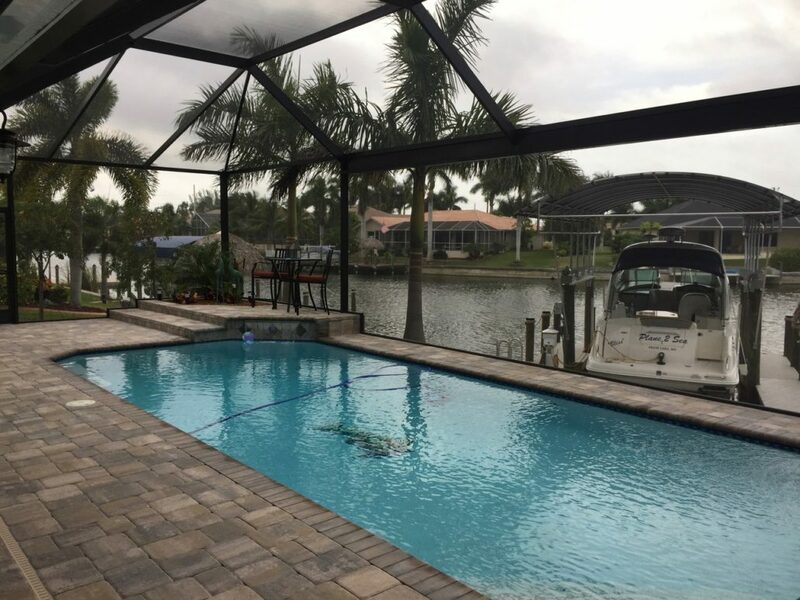 There is simply nothing like The Getaway in Cape Coral. This home is a loaded luxury home starting in the Low $400’s. The Getaway was featured in the 2017 Showcase of homes & walked away as a nine time award winner! Call to find out more about this award winning design!